As I comb through this stash of recipes I absolutely love finding handwritten notes along the way. I feel like these notes give me a glimpse of what my grandmas had on their mind. They are like a sneak peak into their journal. Grandma Joyce was a note-taker at heart, she kept 3 x 5 cards on hand at all times to make sure she didn’t forget a bit of information. They were on the table next to her arm chair in front of the tv and tucked neatly into the pockets of her purse for when she was out and about. A lot of her recipes have notes including the date she cooked the dish, whom she shared the meal with and whether or not it was a hit. Most used quote: “Very Good”. Succinct…to the point. 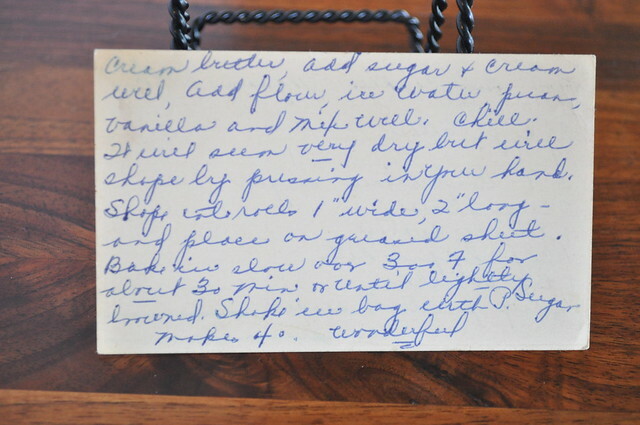 Great Grandma Mary’s notes aren’t as prevalent so there is a lot more guesswork when I experiment with her recipes. 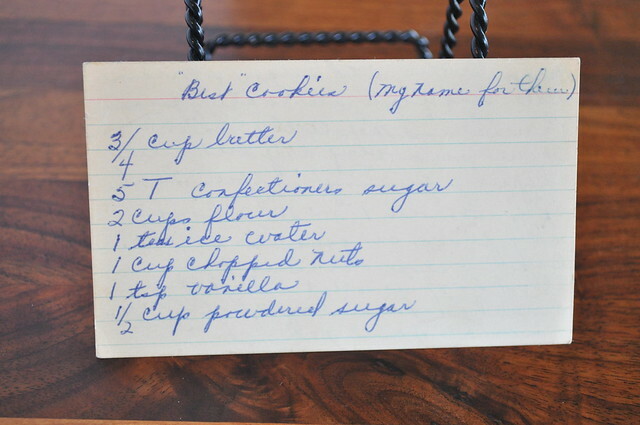 This recipe left no questions…her note still makes me smile. It is a reminder that through this project I’m getting to know my Great-Grandma more and more by the day. Makes me think she had a great sense of humor. I love that she closes with “wonderful” and a squiggle. These must have been her absolute favorite! 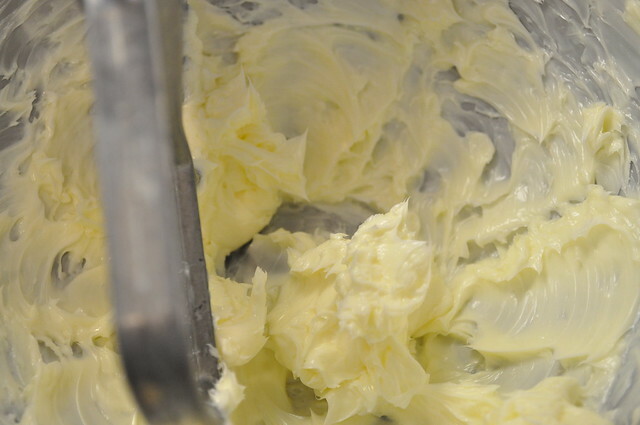 Cream butter in mixer then add sugar and whip again. 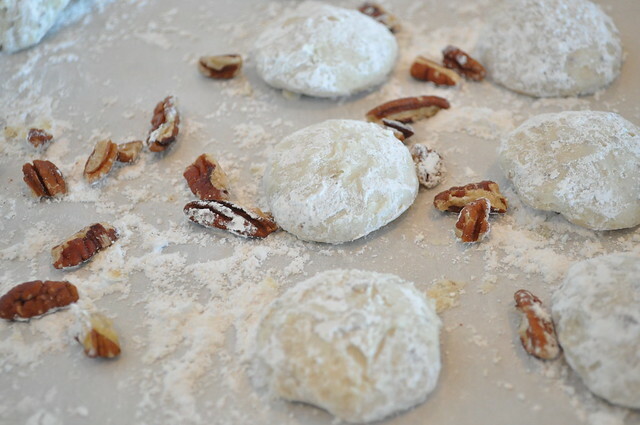 Add flour, ice water and vanilla and stir until smooth..
Add chopped pecans and stir quickly until incorporated. Put mixing bowl in fridge and chill for an hour. 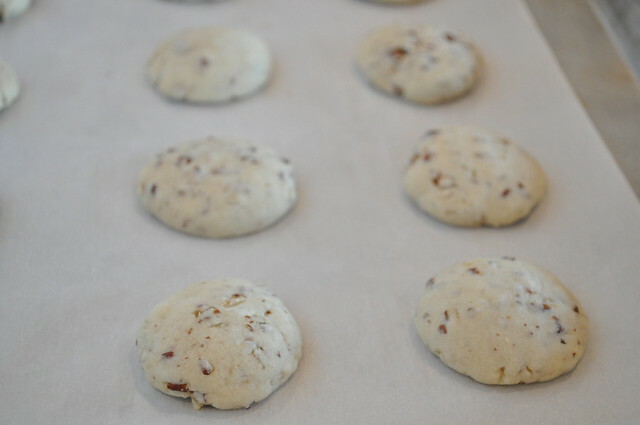 Scoop dough by the tablespoon, roll into a ball (dough may seem dry but it’ll come together with the warmth of your hands. Then gently flatten the ball in your palms and place on the cookie sheet. Bake for about 20-30 minutes (until lightly golden) and then remove from oven. Cool completely before dredging through powdered sugar. This can be done in a bowl or a ziplock bag. Your fingers will get messy, it is part of the job. Nothing you can’t lick off in the end! 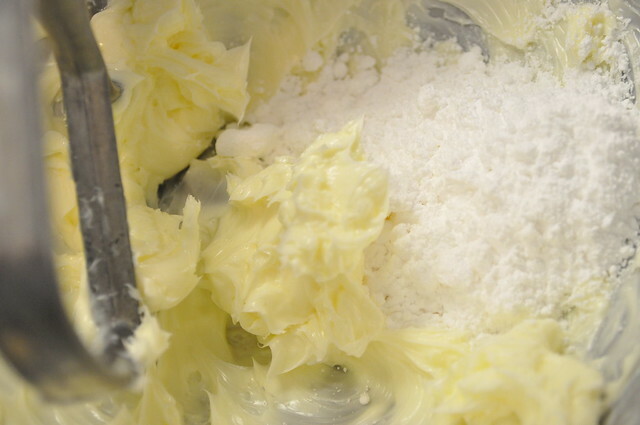 Creamed butter with the powdered sugar. 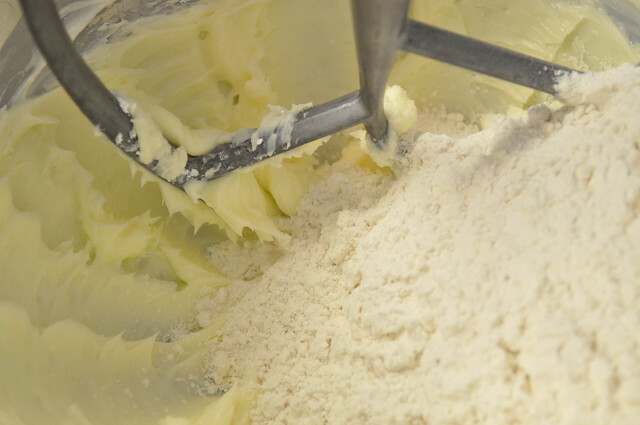 Then add the flour and the liquid. Again, mix until smooth. 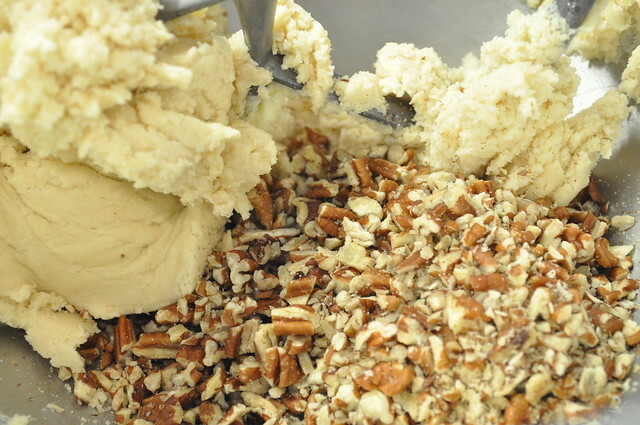 The chopped pecans only need a quickly blend. The perfect dough! 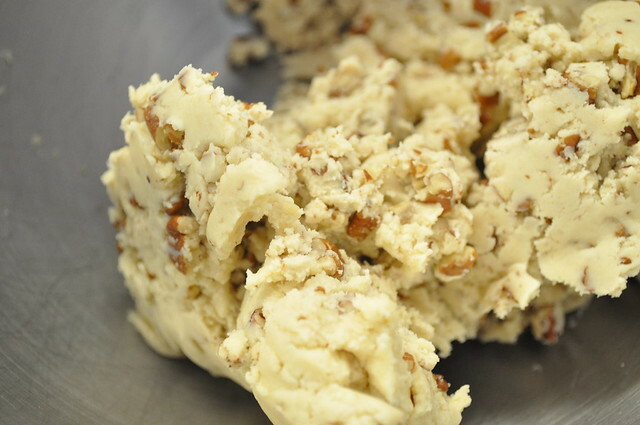 Similar to shortbread…but with the nutty caramel flavor of pecans. She recommended rolling it into logs, chilling, cutting slices and reshaping each. I took a short cut, literally cut some corners. Great Grandma Mary recommended rectangles …hope she’s not disappointed! Powdered sugar on top. This is the way to some people’s hearts…hope there’s a bunch of them in your group! I’m a sucker for chocolate chip. What kind of cookies would you put in the “best” category? Graveyard Bound: Mushroom Quiche MW – R.I.P. If I loved nuts these would go straight into my recipe book! But I think that I have perfected the chocolate chip myself, someday we need to have a bake off! butI am also a big fan of snickerdoodles.